A vibrant account of homecoming and natural change, this story for young readers portrays the meeting of art and nature. After hearing signs of an early spring one February morning, an unnamed artist approaches a blank canvas. He improvises with a careful selection of oil sticks, creating a mountainous scene skirted by dense trees. A lava beast becomes the catalyst for a tale about learning to accept natural developments. The beast—destined to be transformed from an energetic force into a cooled rock—learns to embrace change, not with resignation but with a sense of belonging. 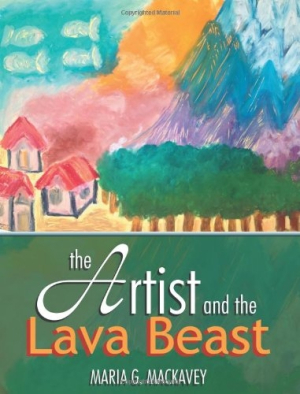 In Maria Mackavey’s The Artist and the Lava Beast, the theme of transformation offers potential teaching points for children who have embarked on chapter books with deeper subjects. Secondary themes of courage and acceptance are briefly touched on through a lone fish, who faces the lava beast. As the lava beast moves through water, traveling toward a group of A-frame houses set in a valley, he gradually slows, growing tired from having “rolled and flowed and oozed,” scorching grass, bushes, and trees in his path. Fear and fatigue lead to a dream in which a voice addresses him, leading to “a fountain of fire…unfolding in his heart” and a return to his origins. Phrases restating similar ideas, including a description of houses that are both “closed up and shut down,” and minor repetitions, such as “he began to feel different” and “he was no longer feeling himself,” keep the story from reaching poetic crispness, but such moments are few in an otherwise colorful, evocative plot shaped by the author’s sense of dramatic pauses. Repetition also occurs in the artwork. Rather than revealing each step of the painting as the artist creates it, a single stock image is reused by cropping and zooming in on different sections, resulting in size variances and sometimes uneven text flow, with slim margins between the images and adjacent paragraphs. Layout aside, this story appeals to the imagination with its blend of science and art, folkloric atmosphere, and honest emotion. For those who relish adventures in artistic creation, ranging from Crockett Johnson’s Harold and the Purple Crayon to Norton Juster’s The Dot and the Line, Mackavey’s The Artist and the Lava Beast is a charming addition to the field.